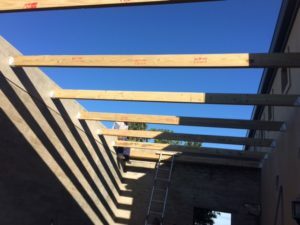 Building legislation requires that any new roofing structure has to be certified by a structural engineer before the building inspector will sign the project off as being completed. The Roof Engineer issues an A19 Structural Certificate which certifies that the structure has been installed to SABS standards or higher. The appointment of an engineer is usually done when the building plans are submitted to the council for scrutinization but, sometimes we find structures like pergolas, verandas, car-ports and even braai rooms being built without plans being submitted to Cape Town Building offices. When problems do eventually occur on the roof covering, for example, if the sheets are rusted and need to be replaced, and the structure is found to be unstable in some way or another, we will recommend an engineer be consulted to make recommendations to upgrade the structure to a safe and insurable standard. Remember, if there is an incident related the roof, you as the homeowner, along with the contractor who did the work, will be jointly liable for damages/injuries. One of the first documents an insurance assessor will request during an investigation is are the building plans and A19 Certificate. A19 Certification is also required when making changes to the roof covering. For instance, if Roof sheeting is being changed out to roof tiles, then the structure will need to be modified to carry the additional weight of roof tiles. This modification will need to be approved by an engineer. Strictly speaking, plans should be submitted to the council but more importantly is that the structure is certified as safe. The reverse is also true when changes are made from a heavy roof covering to a lighter one. The flow of wind over a flat roof makes the roof covering act like a ‘wing’ which can create lift, so the structure needs to be properly secured, especially in windy areas like Camps Bay. Water stains on your ceilings indicate a leakage of some sort and should be addressed immediately. It means that moisture is entering your home via your roof and can cause a multitude of problems ranging from weakening your home’s structure to affecting indoor air quality. The longer you wait to fix roof leaks, the more susceptible you are to damp problems like mould growth. And while you’re busy fixing roof leaks, why not take the time to do some roof waterproofing to prevent future incidents. Below are the reasons why it’s not advisable to ignore water stains and how it can affect you. Mould is the stuff nightmares are made off because it is toxic and harmful to everyone inside your home. It can cause respiratory illness for yourself, family and pets or cause existing medical issues like allergies and asthma to worsen. Mould spores multiply and spread quickly. Your home is receptive to extensive mould infestations once it’s damaged by water. You could have mould underneath wallpaper or behind walls without even realising it. A damaged roof structure will allow animals and pests to get into your home. Pests like mice and rats only need a small hole to enter your roof. You’d be surprised at just how small! Bigger gaps allow birds to make a nest in your roof. Besides the fact that they are a nuisance, bird droppings signify a big health risk to humans and pets. The sooner you get your roof repaired and waterproofed, the better protected you’ll be. You don’t have to be a roofing expert to recognise the implications of a water stain on your ceiling but you might need one to take care of the problem. Get in touch with Ross & Son for all your roof repairs and roof waterproofing needs in Cape Town and surrounding areas. Roof leaks can be a big pain. They can appear at the worst of times forcing you to run around in search of buckets or anything else that might be able to hold large amounts of water. It’s either that or your new laminate flooring will be completely ruined. While it might be tempting to climb up into the roof to inspect the leak or even try to fix it, it might not be the best idea. You could end up doing more damage than good. It is best to hire a professional to assess the situation. A professional roof leak repair contractor will know exactly where to look and what to search for. If there are any other issues you aren’t aware of such as mould, your roofing contractor will inform you straight away. If a proper leak investigation isn’t carried out, any repairs made to the roof might not be effective. Not only will time and money be wasted but it may lead to extensive damage to your home’s interior. Where can I find a reputable and affordable roof leak repair contractor in Cape Town? Finding a roofing contractor in Cape Town can be challenging since there are so many to choose from. Roof Repairs Cape Town has been operational for more than 15 years. They boast 99.9% customer satisfaction from this owner-run business and aim to ensure your project gets the attention it deserves. For an obligation free quote for your roofing, waterproofing and painting needs, get in touch with the team from Roof Repairs Cape Town today. So you think you need a new roof? While there are some obvious indications that a new roof is needed such as it catching fire, collapsing or being crushed by a tree, telltale signs aren’t always readily apparent. So we’ve combined a list of signs to help you determine if you need a roof replacement. If you’re still not sure, it’s best to call a roofing contractor like Roof Repairs Cape Town, to come and do an assessment. Tile roofs typically last 25 – 30 years. If your roof hasn’t been replaced in three decades, there’s a good chance it will need replacing soon. A roof that leaks can cause major damage to your homes exterior paint around the roofline. It can also leak into your home’s walls and leave stains on your inside walls and especially on ceilings. Watch out for any brown stains that may appear after rains. Your roof functions as an insulator against cold and heat penetrating your home. It’s not doing its job if your utility bills keep increasing due to the air conditioner having to work harder to keep temperatures comfortable. If your roof is sagging, it is generally a sign of a structural problem. There might be an issue with the supports in the foundation. This doesn’t mean you are in imminent danger, but it is the type of problem that is better taken care of when small than when it has advanced into something bigger. Replacing your roof is an expensive investment so you’ll want to make sure you’re doing it right by hiring reputable roofing contractors to do the roof replacement for you. Don’t wait too long to replace your roof as you might incur costs due to damage caused by a deteriorated roof. Speak to the team at Roof Repairs Cape Town for an obligation free quote today.